Taken at your beach entrance on Gulf Way, Rolling Surf on this day. The front of your Luxury Pass-A-Grille Beach home, lined with flowering plants, tropicals and boasting two upper balconies with never ending views of the Gulf. Standing on the Beach looking back to your Vacation Home, it emits Style & Views from the Beach or the Balconies. Full kitchen view from the bar counter, to the left is a large walk in pantry for storage. View from the kitchen bar looking out to the dining table and living room on the second level. Beach access bridges are lined up for ease of reaching the shore and offers showers at entry for your feet. The upper level balcony with it's incredible beach views. The sunsets from here every evening are the greatest pleasure to experience. 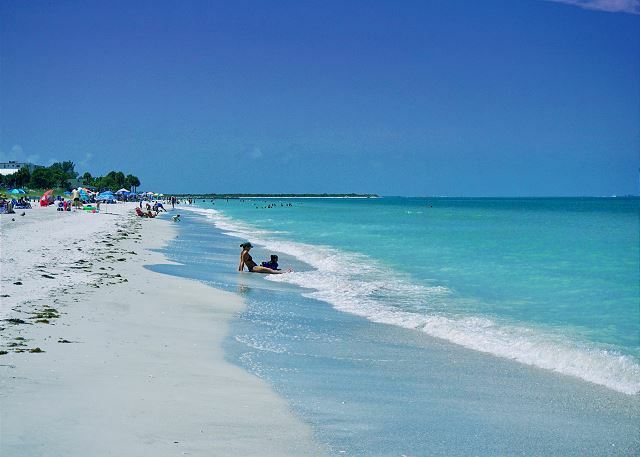 Just across the street from the beach home stretches the aqua waters and sands of Pass-A-Grille. The balcony outside the living room and dining area offers plenty of cozy comfort and beach views. Seating outdoors for lunch, dinner or breakfast make for the best mood enhancing experiencing. The private fenced in backyard offers a play area, a palm covered cabana with seating and parking space. Looking out across the paved drive and yard area from the garage door. The fence is on rollers in the back alley entry. Paradise Grill on the beach, on 9th avenue, offers waterfront seating, breakfast, lunch, dinner, vendors and live music during the weekend and evening hours. The first level patio outside the front entry door. The balcony outside the living room and dining area offers plenty of cozy comfort and beach views. The playground in the backyard, parking space for several cars in the driveway and the entry door used upon arrival. View upon arrival of the entry door to your vacation home. One of the views as the surf rolls up into the sand here on the beach. From the stove looking out across the kitchen, the window has a beach view, the sliding doors just past on the left lead to the beachfront balcony. View of the kitchen with counter bar seats for visiting, very open and spacious, comes complete with cook ware and dishes, dish soap and paper towels for your arrival. One of the sitting corners in the living room just off the balcony. The downstairs living room with flat screen TV, open floor plan with a kitchen, dining and balcony facing the beach. Upstairs sitting area between the bedrooms with a view of the Beach. Master bedroom with an abundance of closet space and an ensuite bath. Decorated for comfort and a view of the beach from your window. 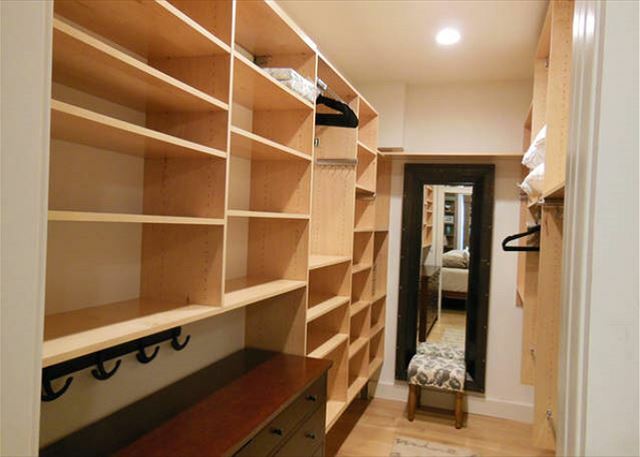 The Master bedroom closet is spectacular! No need to worry about storage space while living in this Beach Vacation Home. 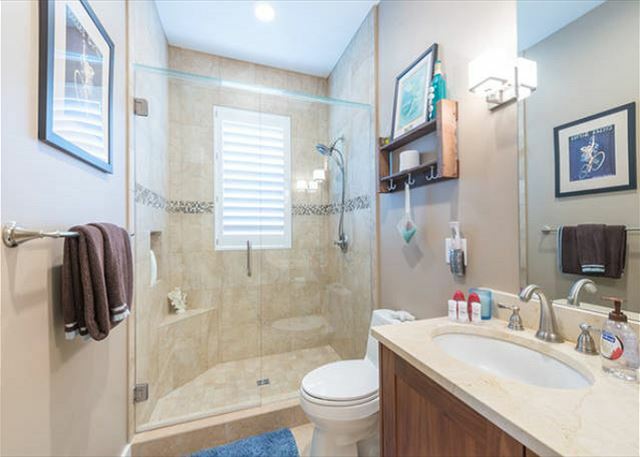 The Master ensuite bath with it's deep jet tub surrounded with spaces at both ends for your toiletries while bathing. 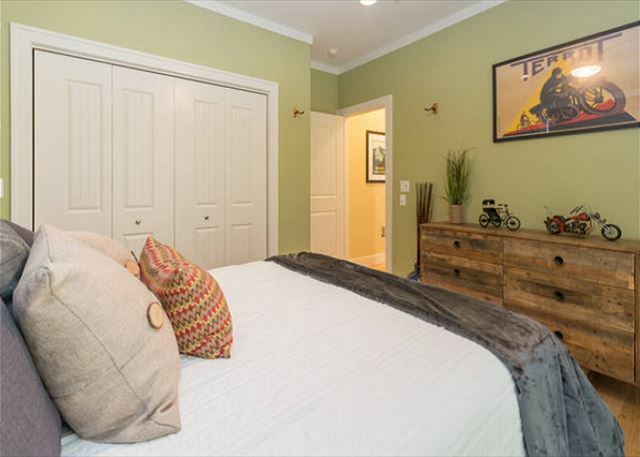 The Queen Guest Bedroom with comfort in mind offers an abundant closet space and dresser for storage during your stay. The guest full size bedroom has been carefully decorated in a modern design complete with a window seat. View from the window seat in the Full bed guest bedroom, the closet is complete with an organizer. The Master ensuite bath tiled shower is spacious with double shower heads for your pleasure. The Laundry Room is located on the third level, front loading machines, a folding area on top, wash sink and cabinets. Laundry soap is provided for your stay. Upstairs hall off of the sitting area between bedrooms, a great place to hang out. 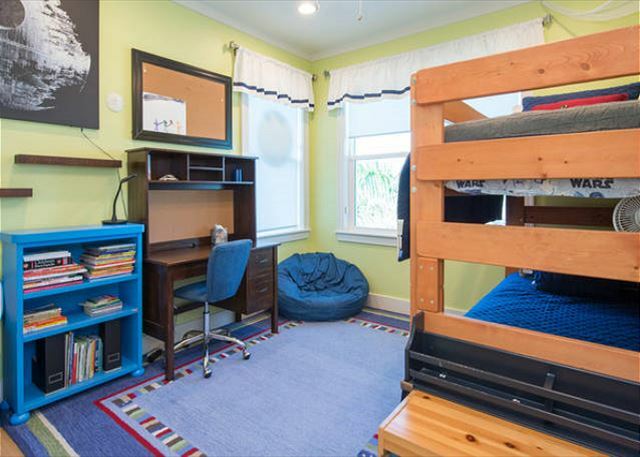 As you enter the Twin bunk bedroom, a desk for working, books and shelving, and also a closet for storage is there for your use. The bunkbed room is located upstairs, plenty of space for two young people or even older, you will also find games for entertainment. Your view as you enter the Master Bedroom, behind the curtains are sliding doors to your beachfront balcony view and seating. 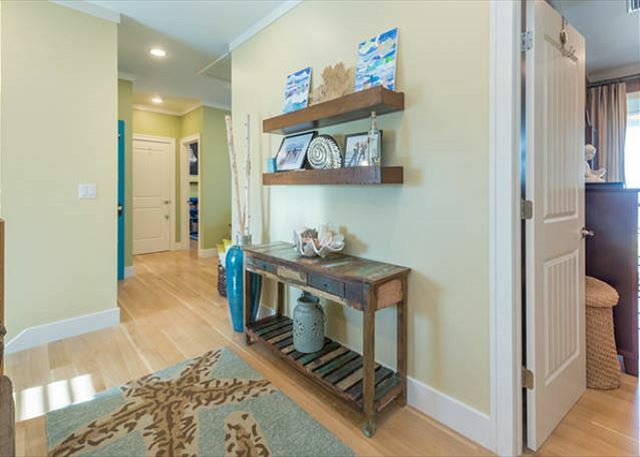 Gulf Walk Breeze is a Rare to Find Vacation Rental Home situated on Historic Pass-A-Grilles Gulf Way. Visit one of Florida's Top 10 Beaches and enjoy the most Gorgeous Sunsets from one of your two Private Balconies. An exclusive retreat this 3 story, 4-bed 3-bath Florida Home sleeps 9 and is just across the street and facing the warm waters of the Gulf of Mexico. You're in walking distance to terrific Restaurants, Shopping, Rentals, Fishing, and Boating right in your neighborhood. 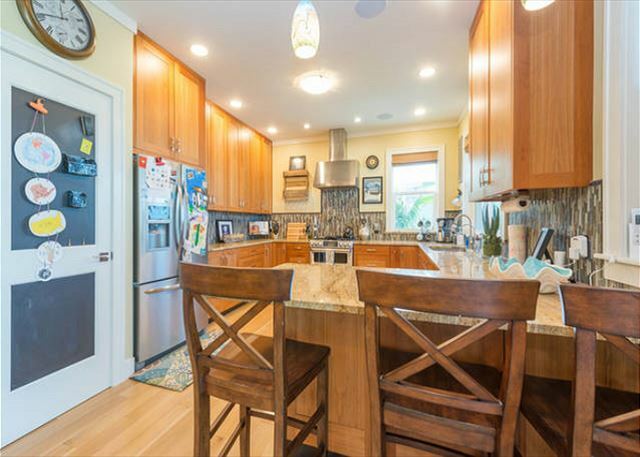 This beach house is equipped with a full kitchen - refrigerator, stove/oven, microwave, dishwasher, toaster, breakfast counter, living room, dining area, Wi-Fi, and cable. In the front of the house there are balconies with seating on the 2nd and third floor facing west toward the beach with seating for four and a swinging chair that seats 2. In the backyard theres a fenced in driveway, playground and lounge area with seating for 8, a playhouse with slide and rock garden. Guests have access to the entire house excluding the 1st floor garage and storage rooms. You’ll love this Tropical Beachside Retreat because of the comfy beds, coziness of the rooms, large balconies with views of the Beach, Sunsets and the close proximity to downtown St. Petersburg. 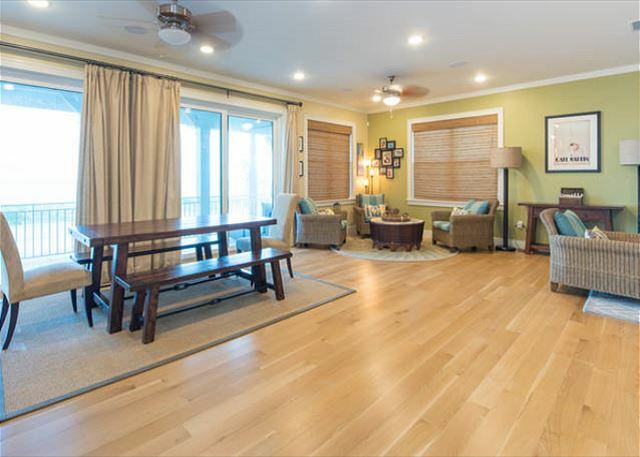 Gulf Walk Breeze Beach house is fantastic for couples & family vacations, Solo Adventurers, Business Travelers, Families (with kids), and even big groups when rented. We work closely with guests to ensure a wonderful stay. Occupancy Limits are strictly enforced. Download our App for Apple & Android, the link is available at the bottom of each page on our website. This App will offer all the information needed for your arrival.